by the owner. The owner did not know how to clip the dewclaws (on the back legs) and they became imbedded (grew into) the pads. 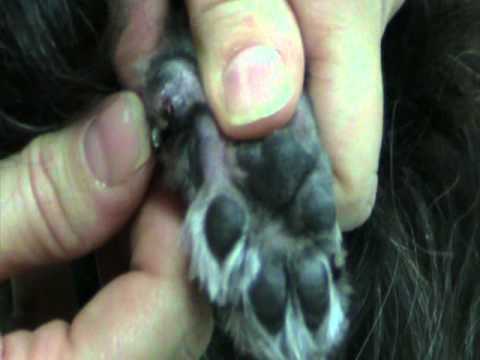 Learn how curly dewclaws look when they grow into the nail bed, how to clip them, and how to treat the infected hole that is left on the pad. www.thepoochparlor.net in Ponderay, Idaho. Nine Colorado prisons have enacted a program which allows inmates to train dogs. As Mark Strassmann reports, these canines have helped in the rehabilitation of the prisoners. Some pieces from my movie dog collection in a slideshow dating from the earliest days of film to modern times. Song is Dog Dreams, by The Story. Please comment! Thanks for watching! 1. Blair from the 1905 short film Rescued by Rover, first canine movie star. 2. Strongheart, from a painting by Charles Livingston Bull. 3. Newspaper clipping from 1925 Rin-Rin-Tin film Below the Line. 4. Photo of the original Rin-Tin-Tin. 5. 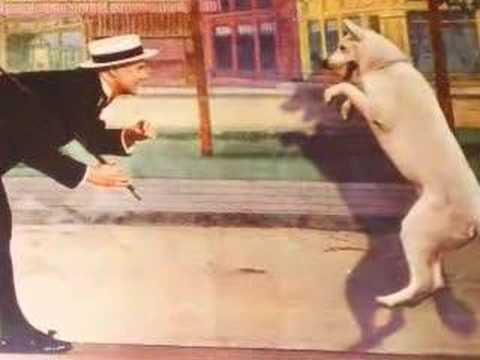 Rin-Tin-Tin Jr. lobby card from The Wolf Dog. 6. One-sheet poster of Tracked with Ranger the German Shepherd Dog. 7. Ad for A Dog of Flanders with Lightning, Strongheart’s grandson. 8. Teddy the Great Dane and Jackie Coogan in A Boy of Flanders. 9. Lobby card from Detective K-9 with Fearless, another GSD. 10. Pete the Pup from the Our Gang (Little Rascals) shorts. 11. Ad for Under the Black Eagle with GSD Flash. 12. Terry (Toto) the Cairn Terrier and Judy Garland. 13. Silver Wolf the GSD on the set of Radio Patrol. 14. Captain and Lady on a lobby card for Fighting to Live. 15. Asta the Wire Fox Terrier with Myrna Loy and William Powell. 16. One-sheet poster from Shaggy. 18. Pal (Lassie) and Roddy McDowall. 20. Lobby card from Kazan with Zorro the white GSD. 21. Lobby card from My Dog Rusty with Flame. 23. Three-sheet from Shep Comes Home with Flame. 24. Lobby card from Ole Rex. 25. Half-sheet poster from Big Dog Lost, aka Big Jeeter. 26. One-sheet from A Dog’s Best Friend. 27. Chinook the white GSD on one-sheet for Fangs of the Arctic. 28. Chinook on a three-sheet for Snow Dog. 29. Half-sheet for The Silent Call with Spike, the Lab/Mastiff mix who played Old Yeller. 30. Lobby card from The Secret of Magic Island. 31. One-sheet from The Boy and the Laughing Dog, aka Good-bye, My Lady, with a Basenji. 32. Lobby card from The Littlest Hobo with London the GSD. 33. London from The Littlest Hobo, and family. 34. Novelizations of Summerdog, My Dog the Thief, Digby; the Biggest Dog in the World, and The Shaggy Dog, along with a movie edition of Old Yeller. 35. Old Yeller rerelease one-sheet. 36. The Incredible Journey insert poster. 37. Big Red insert poster. 38. Nikki; Wild Dog of the North, aka Nomads of the North, rerelease one-sheet. 39. Lad: a Dog insert poster. 40. Kelly and Me lobby card. 42. Digby; the Biggest Dog in the World half-sheet. 43. Photo from Monster on the Campus. 44. They Only Kill Their Masters insert poster. 46. Italian posters for The Call of the Wild, Siblings of the Wind, and There was a Castle with Forty Dogs. 47. Photo from Won Ton Ton; The Dog Who Saved Hollywood. 49. Photo from The Pack. 50. Italian poster from Antarctica. 51. For the Love of Benji one-sheet. 52. Benji with trainer Frank Inn on the set of Benji the Hunted. 53. Benji the Hunted one-sheet. 54. Benji off the Leash one-sheet. 55. Books: 101 Dalmatians, 102 Dalmatians, Benji of the Leash, Because of Winn-Dixie, Firehouse Dog, Benji, For the Love of Benji, Cujo, To Dance with a White Dog, White Fang II, Zeus and Roxanne. 56. Lobby card from K-9. 57. We Think the World of You one-sheet. 58. Betsy the long haired GSD and Alan Bates. 59. Australian Cattle Dog in The Road Worrier. 60. Movies: Where the Red Fern Grows, Dusty, Little Heroes, The Amazing Dobermans, Turner & Hooch, The Call of the Wild. 61. The Journey of Natty Gann one-sheet. 63. Iron Will mini poster. 65. Comet the Golden Retriever (in makeup) with Matthew Modine in the movie Fluke. 66. Photo from Beethoven’s 2nd. 67. Air Bud movie cover. 68. Shiloh, My Dog Skip, Cats & Dogs. 69. Homeward Bound II: Lost in San Francisco novelization. 70. Chihuahua with Reese Witherspoon in Legally Blonde. 73. Because of Winn-Dixie one-sheet. 74. Huskies from Eight Below on DVD store display box. 75. The Shaggy Dog one-sheet. 76. Firehouse Dog DVD release one-sheet poster. Tips on putting your puppy in a crate and how to help them adjust in this expert video featuring a professional dog trainer. Bio: Elise McMahon has a Ph.D. in animal behavior, and has been working with both domestic and wild dogs since the early 1990s. Soi Dog Foundation – Great New Film..